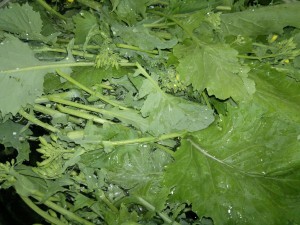 Cima di rapa, also known as sprouting turnip tops, rapini, or broccoli raab, is the Italian name for a cruciferous vegetable that somewhat resembles broccoli, but produces only small flower spikes. As it does not grow to any great size, it can crop very quickly. This is our first year growing it. We sowed a few rows in the polytunnel at the beginning of April and it was ready for harvesting this week. It appears to be a versatile vegetable, suitable for various methods of preparation and ideal as a side dish. In southern Italy, particularly in Puglia, there is a traditional dish of cima di rapa with orecchiette, a small pasta shape that is somewhat round and dished. 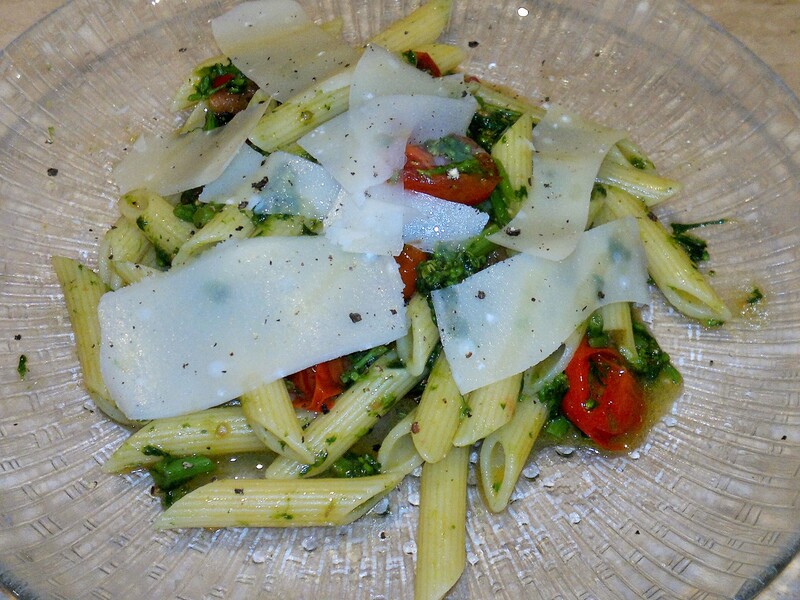 I decided that this would be a good way to try it first, although I had to substitute penne for the orecchiette. Cima di rapa is said to have a slightly bitter taste, so to balance that I included some cherry tomatoes. At this time of year, we do not have our own tomatoes, but at least these were local produce. 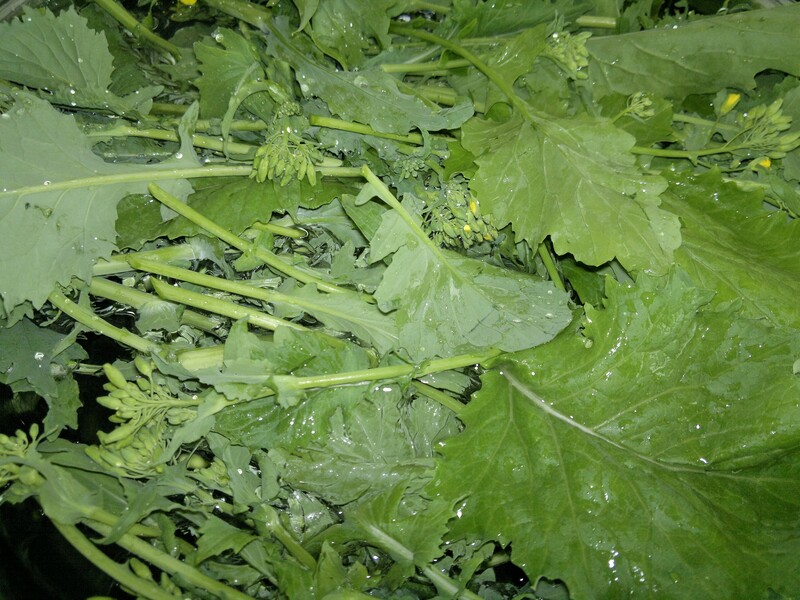 Unlike broccoli, the cima di rapa has thin tender stems and needs only a little cooking. To keep its vibrant green colour, I blanched it in boiling water for just a few minutes, before draining and cooling quickly in a bowl of iced water, which stops the cooking and sets the colour. 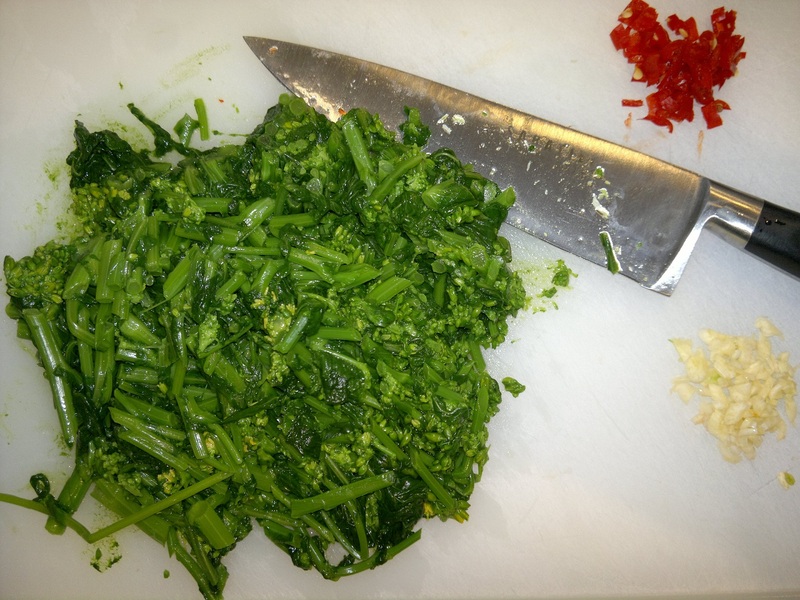 The taste of the cooked greens was very good indeed; not too strong and the stems were actually quite sweet. This is a simple dish, which only takes about 20 minutes to prepare, but it is delicious and will be making regular appearances whenever we have cima di rapa to hand. I suppose sprouting broccoli would make a suitable substitute, or, indeed, leafy greens such as chard or spinach. Place the cima di rapa in a large bowl of water to encourage any wildlife to depart. Slice the cherry tomatoes in half. Peel and chop the garlic. Finely chop the chilli, removing the seeds if desired. Wash the cima di rapa carefully, rinse, and drain. Fill a large bowl with cold water and add some ice if available. Bring a pan of water to the boil then add the cima di rapa. Blanch for three minutes or so, then drain quickly and immediately drop in the iced water to refresh. Bring a pan of water to the boil, add the pasta and a good pinch of salt. Drain the cima di rapa and chop coarsely. With four or five minutes to go before the pasta should be ready, place a frying pan over a moderate heat and add a generous splash of olive oil. Fry the chilli for a minute or so, then add the garlic. Cook for a few seconds more, but do not allow the garlic to brown. Add the tomatoes and cook for another three or four minutes. They should start to soften a little, but not turn into tomato sauce. Add the cima di rapa and warm through. When the pasta is ready, reserve a little of the cooking water, then drain and add the pasta to the sauce. Stir, incorporating a little of the cooking water as needed to form a suitable coating consistency. Serve, adding a few shavings of pecorino or parmesan if desired.